A record number of runners descended on Kielder Water & Forest Park, Northumberland today for ‘Britain’s most beautiful marathon and half marathon (4 October). And Middlesbrough’s Matthew Jones, was crowned the new champion of the Active Northumberland Kielder Marathon, while Karl Taylor was the inaugural winner of the Kielder Half Marathon, setting the record at 1 hour 14 minutes and 35 seconds. The new half marathon attracted nearly 700 runners, including BBC newsreader Sophie Raworth. Around 850 runners made their way around northern Europe’s largest man-made lake, Kielder Water in the sixth year of the Marathon, which is held every year at Northumbrian Water’s Leaplish Waterside Park. Matthew, who is a doctor of cardiology in Middlesbrough, has taken the title off three-time marathon winner Ceri Rees, who gave North East runners a sporting chance this year when he decided not to take part. Northumbria University Lecturer, 36-year-old, Gemma Bradley, from Gateshead was the first female to cross the marathon finish line. The Junior Races took place while the marathon and half marathon were underway and saw more than 100 children take part in either the Osprey (880m race for children aged seven to nine) the Roman Mile (1.48km race for children aged ten to twelve) or the Centurion (2.5km race for children ages thirteen to fifteen). 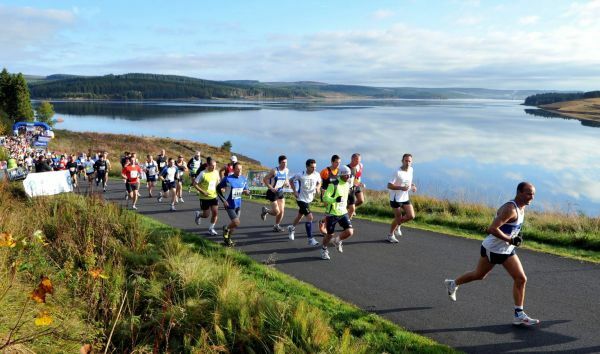 Kielder Marathon attracts runners and outdoor adventure enthusiasts from around the world to the dramatic setting and unique course. Councillor Val Tyler, Cabinet member for Arts, Leisure and Culture at Northumberland County Council, said: “The addition of the half marathon to this year’s event shows the popularity of Kielder and Northumberland for outdoor activities.